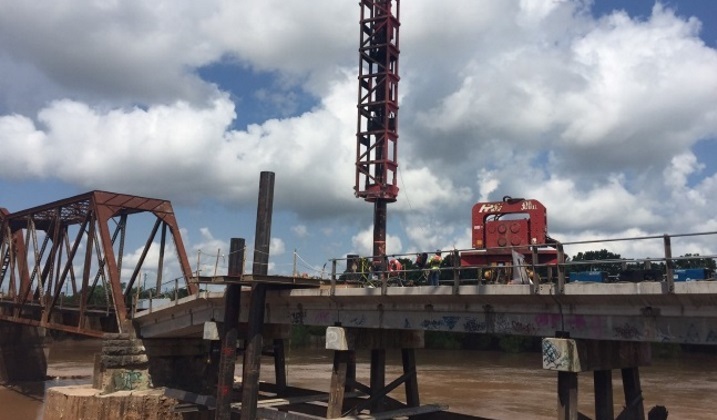 Emergency Stabilization of Two Brazos River Piers – UPRR Bridge 32.42, Richmond, TX | OCCI, Inc.
South Texas experienced record floods in June 2016, exceeding previous records by over four feet. 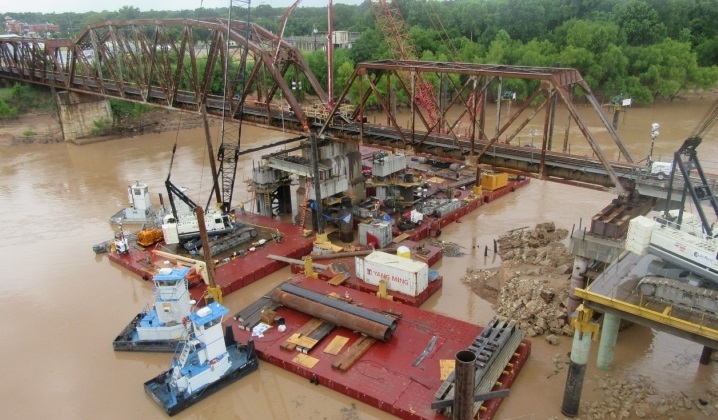 This flood event had a major impact on Bridge 32.42 – Pier 1 was on the river bank, supporting a truss span and a precast approach span. As a result of the flooding, nearly 100’ of river bank was lost causing significant scour to Pier 1 and adjacent approach spans. Pier 1 settled two feet in the first few days and four feet prior to the spans being stabilized. 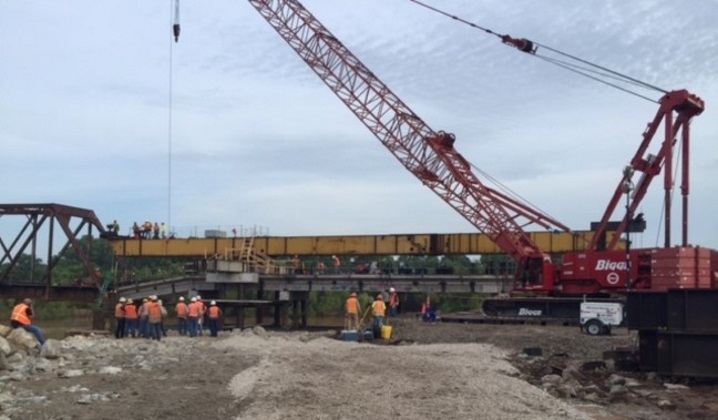 An innovative method was engineered to cantilever support beams off of the approach spans to stabilize spans while a new pier could be constructed. After 16 days of working around the clock, Pier 1 was replaced and trains were running. As OCCI began to demobilize, it was discovered that Pier 2 was settling in increments of inches per day. This was of major concern since Pier 2 supports two trusses, and the only feasible access was by barge. OCCI re-mobilized, and focus shifted to Pier 2. The challenge was to quickly design and construct pile bents in deep, swift water. 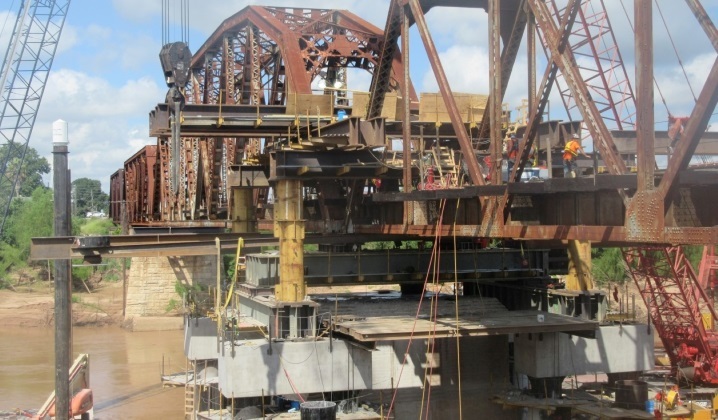 Following accelerated design and fabrication, innovative braced frame assemblies were installed below water level and around the existing pier that included a new steel cap, corresponding steel grillages and bearing supports. After another 22 days of working around the clock, Pier 2 was replaced and train traffic restored.